It is a curious piece of public relations. 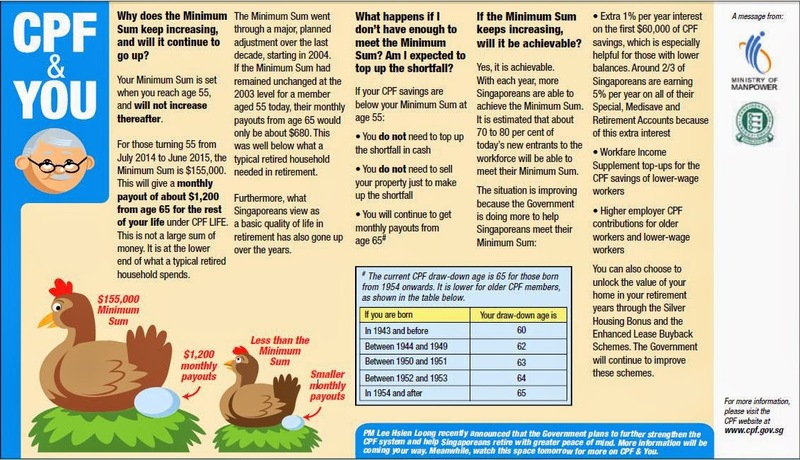 The current Minimum Sum will give a monthly payout of about $1,200 from age 65 for the rest of a person's life under CPF LIFE. • Changes in mortality experience. If more people live longer than expected, the monthly payout might be lower, and vice versa. • Changes in investment income. If investment returns are higher than expected, the monthly payout might be higher, and vice versa. • Transactions that affect the Retirement Account balance e.g., refund of money from selling a property, top-ups, lump sum withdrawals etc. • Changes in the extra interest on the combined balances in a member's CPF accounts, including the amount committed to CPF LIFE under the LIFE Basic Plan, as the combined balances fall below $60,000. "(7) Notwithstanding anything in this Part [IIIB]or the relevant regulations, the [Central Provident Fund] Board shall not make any payment under this Part unless the Lifelong Income Fund is solvent." That is, CPF LIFE payouts will cease if CPF LIFE Fund is insolvent. CPF LIFE's monthly payout of about $1,200 is at the lower end of what a typical retired household spends. If a typical retired household spends $1,200 a month, does this mean that each member of a two-member household spends $600 a month? Does this mean that CPF LIFE's monthly payout and the Minimum Sum have been over-stated by a factor of two for two-member households? About 70 per cent to 80 per cent of today's new entrants to the labour force is estimated to be able to meet their Minimum Sum. It is not clear how anyone can confidently project 30 years or more into the future. It is not clear whether the Minimum Sum applicable to today's new entrants is the same as the target Minimum Sum ($120,000) plus inflation adjustment. Is the Government saying that the target Minimum Sum will not be raised any further? With each year, more Singaporeans are able to achieve the Minimum Sum. • An extra 1 per cent on the first $60,000 of CPF savings. Around two-thirds of Singaporeans are earning 5 per cent on all their Special, Medisave and Retirement Accounts due to this extra interest. • Higher employer CPF contributions for older or lower-wage workers. • Minimum Sum Topping Up Scheme. In 2013, there were 60,462 cash and CPF top-ups amounting to $401 million. • Sale of property. From 1 January 2013, members regardless of age must refund the principal amount withdrawn for a property, with accrued interest, when they sell the property. For members aged 55 and above, such refund is used for setting aside the Minimum Sum and the Medisave Minimum Sum before disbursing any balance to them. • CPF withdrawal. Prior to 2009, members could withdraw 50 per cent of their Ordinary and Special Account balances, together with any balances after setting aside the Minimum Sum and Medisave Minimum Sum. Beginning 2009, this was reduced by 10 percentage points a year, so by 2013, members could not withdraw any money from their Ordinary and Special Accounts before setting aside the Minimum Sum and Medisave Minimum Sum. The more adverts CPF puts out the more confused the matter becomes. This is another piece of wool over our eyes.